The list of King Henry VI Part 1 characters provide a convenient introduction to the William Shakespeare play summary of King Henry VI Part 1. The male and female characters bring the plot of the play to life. Not only do we remember the stories but we remember the people - we all have our favourite characters. The following short summary of King Henry VI Part 1 provides a brief description of this famous William Shakespeare play. The story of the plot with its famous characters via the summary of King Henry VI Part 1. Interesting facts and information about the Globe Theatre of Elizabethan London with a William Shakespeare Play Summary of King Henry VI Part 1 with a list of Characters. This drama is one of the great history themed plays by William Shakespeare. The plot story starts with the death of King Henry V and his young son takes the throne as King Henry VI. 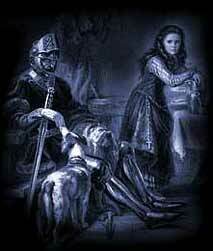 Gloucester serves as Lord Protector to guide and advise the young King through his early years. In France Joan of Arc leads France in the fight against the English. A quarrel breaks out between Richard Plantagenet, of the House of York, and the Earl of Somerset, of the House of Lancaster. The young King intervenes and restores order pledging his inheritance to the House of York. The king goes to Paris to be crowned in order to motivate the English and demoralise the French. The English capture Joan of Arc and Margaret of Anjou. Joan is burnt at the stake as witch and a heretic. King Henry, urged by the Earl of Suffolk, marries Margaret of Anjou. The play ends with a gloating Suffolk believing that Margaret of Anjou will rule the monarch. Suffolk believes will rule both of them giving power to the House of Lancaster. Interesting Facts and information about the Summary of King Henry VI Part 1 and Characters. Additional details, facts and information about the Globe Theatre and the summary and characters of other William Shakespeare plays can be accessed via the Globe Theatre Sitemap.